I don’t want to worry you, but if you’re in Spain there’s a giant hairy hand under your bed, waiting to grab you if you don’t go to sleep. In Iceland there’s a child-eating giantess who will be able to hear you if you’re naughty. Meanwhile there’s a horrible shape-shifter out to grab Inuit children in the snow up north and a formless terror lurking in Portugal – so scary it can’t be described. 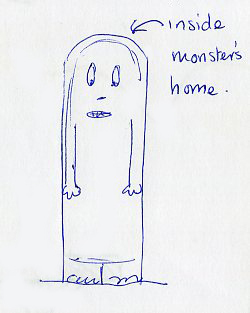 In the course of researching mythical characters who help children I’ve found myself waylaid by monsters that have been used by parents around the world to scare their children into behaving. It’s a cast of terrifying beasts, I can tell you, all used in the past to stop children wandering into the dangerous countryside, staying out in the dark or just being plain naughty. There are shadow creatures, child-eaters and a number of weird characters with sacks. 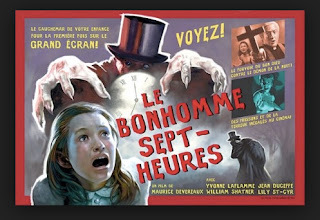 The one I find particularly scary-sounding is Bonhomme Sept-Heures – Mr Seven O’clock. He’s said to lurk around Quebec with his sack, waiting to grab children who haven’t gone indoors by seven. It’s his very specific name that sounds so chilling to me! There’s sometimes a religious connection, too. A friend’s father had interesting experiences of Krampus, a nasty sidekick of St. Nicholas who turns up in Austria at Christmastime to punish naughty kids, while St. Nicholas rewards the good ones. As a boy my friend’s father would watch the town parade on December 6th, and while St. Nicholas threw treats, young men of the town dressed as Krampus, carrying large sticks and chains to threaten the onlooking children. 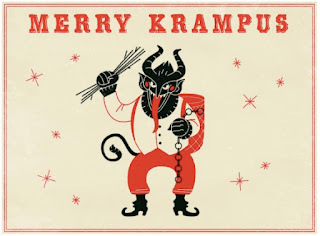 The young boy’s father, meanwhile, would wait until his son was in bed and then scrape snow chains up and down the stairs to terrify him into thinking Krampus was about. Tough parenting or what? Apparently it was all connected to the fierce-sounding Catholicism of the area. It was deemed vital that children were suitably terrified of behaving badly so they wouldn’t go to Hell. Having asked around I only found one person under the age of 70 who remembered any of these bogeymen and women being used on them, so it seems we’ve moved on in my neck of the woods, thank goodness. But friend and multi-talented children’s illustrator Estelle Cork had imaginative parents who cooked up their own version, declaring that some local grain silos were the ‘Monster’s Home’ and Estelle had better behave or she’d be sent there. Terrified whenever she passed them on the horizon, she imagined the monsters inside in the exact shape of their silo containers, as per this sketch (she may have done this for her therapist but I didn't like to ask). I’m glad we’ve consigned these bogeymen and women to the past, but in some cases we’ve gone to the other extreme. A recent survey suggested that a third of parents surveyed would not read a story to their child if it had a bad character in it. I even read a recent blog where a parent urged people to self-censor picture books as they read them – giving examples of how to do it which basically rendered the books nonsense. Of course you wouldn’t read a story that freaked your child out, but surely those parents should have more faith in their child’s intelligence. Reading a story with a baddie in it, getting his or her comeuppance, teaches good values. Reading a story together in a safe environment gives your child the opportunity to regulate their anxieties - with your help and the help of the author who is going to make things come out right at the end. I’m not suggesting that parents specifically go out and look for books with villains in them. I’m suggesting that it’s OK to relax a little about content. Trust the author and trust your child. Don’t start censoring their books. Anyway, I'd love to hear if you were scared by bogeymen/women/things when you were a child, to keep you on the straight and narrow. And if so, did it work? Currently writing a book which is top-secret until 2018. If I told you I’d have to send Krampus round! PS: If you’d like to read more about some of the weird child-catching bogeymen and women of yesteryear, here’s a great site on European monsters. Definitely don’t share it with your kids, though. Wow, these are great! I love a good (bad) villain. Cruella is probably my favourite. We always had repeated messages about stranger danger. It's something I try and instil in my kids but I admit to finding it hard to pitch correctly. I want them aware but I don't want to clobber their confidence. I wonder if we're more reluctant to share badness as there seems to be so much genuine horror around? Maybe we want to shield kids from dangers for as long as we can? Great post, Moira and I do hope the secret book contains a dose of peril. Yes, it's a hard thing for writers to get right, too, I think. It relies on writerly instinct. But I don't like the idea of no baddies at all, ever. I think there's a place for a wolf who gets his comeuppance. Re: the much worse bogey things inflicted on kids in the past - Realising that many of the bogeys of yesteryear seem to have died out in Europe in the Twentieth Century, I did wonder if the all-too-real horrors of the World Wars might have had something to do with that. Crikey! That was old-school, Jane! Being beaten and taken away in a sack is so terrifying! My son howled when he first saw Father Christmas. It was a problem because we were on a steam train hoping to give him a lovely xmas treat. We'd calm him down and then Santa would walk through the train again, and he'd recommence the howling! Great post, Moira! I think many children love a really villainous villain and get great satisfaction from seeing them get their comeuppance. I've written elsewhere about how I think children's films, TV and video games do a far better a job of reflecting the appeal of "irredeemable villainy", which is one of the reasons why I think many children, especially boys, prefer these media to the generally cosier media of picture books. I was so scared by Chitty-Chitty-Bang-Bang’s child-catcher when I first saw him that I literally ran screaming from the village hall where I was watching the film. But it became my favourite childhood film and has been a huge inspiration to me as an author. I accept that such characters will not be to every child taste’s, but there are thousands of other books these children can enjoy instead. The overly-censorious attitude that if some children will be upset by something, it should not be in a picture book is preventing many young children from engaging with books and breaking their reading habit before it’s even started. Adore your blog post, Moira, and nobody has threatened me with a bogeyman to say that! I'm in my fifties and as a child was never threatened with a bogeyman. The threats were things like 'no TV' or 'no bike', or a spanking or early to bed. But those were for specific deeds, whilst bogeymen are meant to influence your behaviour at all times. I suppose the majority of picture books aim to be reassuring and cosy as they're most often read at bedtime. That survey sounds weird. We do have plenty of villains in books for 6+ and I agree that children adore them as at that age they have a strong sense of fairness and want baddies to get their comeuppance as the world is still black and white, not grey. I've just had a thought - the Good Fairy in Michael's Rosen's 'Little Rabbit Foo Foo' picture book is a modern bogeyman. If the rabbit doesn't change his attitude and start behaving, there's the threat of being turned into a goonie, which is what happens! Ah yes! 'Being turned into something' if you don't behave is an interesting avenue, Paeony. I wonder if that's a worldwide cultural idea, too. I will investigate! These days parents can use technology as the behaviour threat - no computer/ipad/phone/TV. In centuries past many wouldn't have owned much to take away, I guess, except food. (bed with no supper). Thoughts of bogeymen for children reminds me of the book that Marilyn Brocklehurst waived about at the recent Patron of Reading conference. It was one of the several horrors she had found in a CURRENT school library; 'Stranger Danger' by Jimmy Saville. Aaaaagh! The Balloon Analogy: When to share new work?